MATSU in Japanese can either mean "A pine tree" or the verb "to wait". 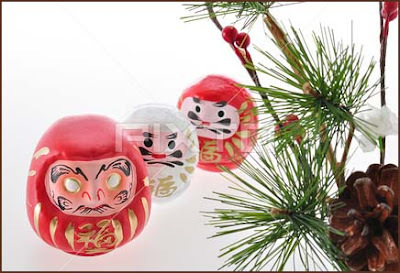 The symbolic meaning of the Pine Tree is "Long Life".
. shoochikubai 松竹梅 pine, bamboo, plum .
. WKD : Pine (matsu) . The auspicios symbol of the pine is found in many places in Japan. In the old Japanese poem collection Manyoshu『万葉集 there are many mentions of the pine tree like "growing abundantly like the pine tree". During the New Year season it is the custom to place an arrangement of pine greenery at the corners of the manor (kadomatsu 門松), to pray for the well-beeing of the household during the coming year. 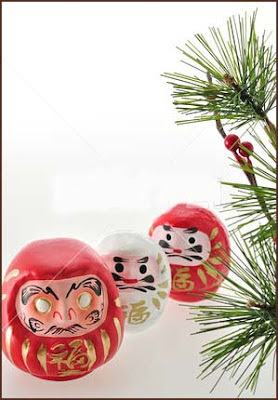 Daruma as a symbol for the indomitable spirit of never giving up, toghether with the Pine - a display of such a Daruma contains the wish for the health and long life of people. 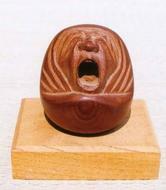 We have seen similar Daruma figures in the story about Sanuki carving. On a recent visit to the famous temple Zentsu-ji 善通寺in Shikoku I found an interesting piece of wood, honored in the temple grounds, which seems to be the ancestor of all the Sanuki carving pieces. This temple was build in memory of the birth of the famous Kooboo Daishi, originator of the Shikoku Pilgrimage, whom we have met frequently in these stories. The temple is not Nr. 1, as one might think, but Nr. 75 towards the end of the 88 temples. "Kukai was born in 774 in Byobu-ga-ura (Screen Bay), an inlet village near Tadotsu in the Sanuki prefecture of Shikoku. Zentsuji, which is further inland also claims to be his birthplace pointing to a dilapidated temple said to be on the very spot once occupied by his parents' house." 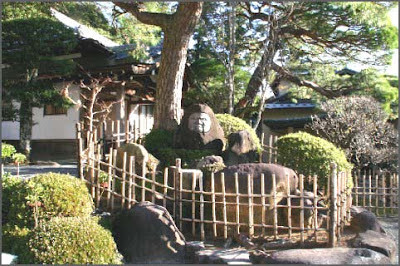 In the garden of Zentsu-ji we find the famous "Pine of the Revered Image" 御影の松. 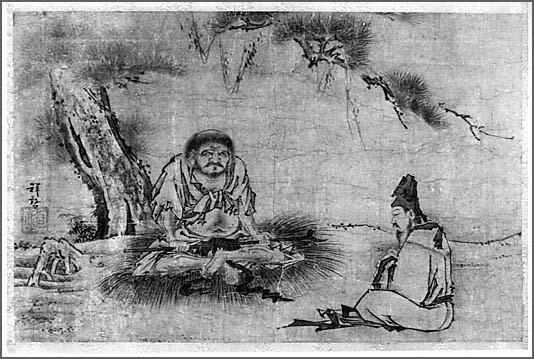 When Kukai came back to his birthplace after studying in China, he could not meet his mother. 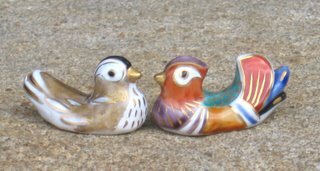 So he leaned over the pond 御影の池 Mikage no Ike, and had his features depict in the water. He then painted his features and sent this picture to his mother. The pine tree nearby, which witnessed this event, is withered now, but his huge body is still revered as a holy relic of the time. When you stand in front of this huge piece of weatherbeaten wood, it still feels alive and vibrant with energy. You can imagine Daruma san or Kukai himself just climbing out of it any time. 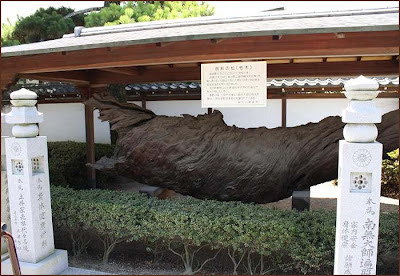 There is another famous old tree of the temple compound, a huge camphor tree of more than 1200 years. It is said it has witnessed the birth of Kukai and was loved by the young boy, who run there to hide in the branches when in trouble.